In last week's "Housing in Hard Times", I suggested that there are some things that we in the housing industry can do - one is to study the supply side and see how to reduce costs: and we looked at Chou's wall and floor building system. The other is to examine the demand side. An important consideration must be to study what customers can afford. 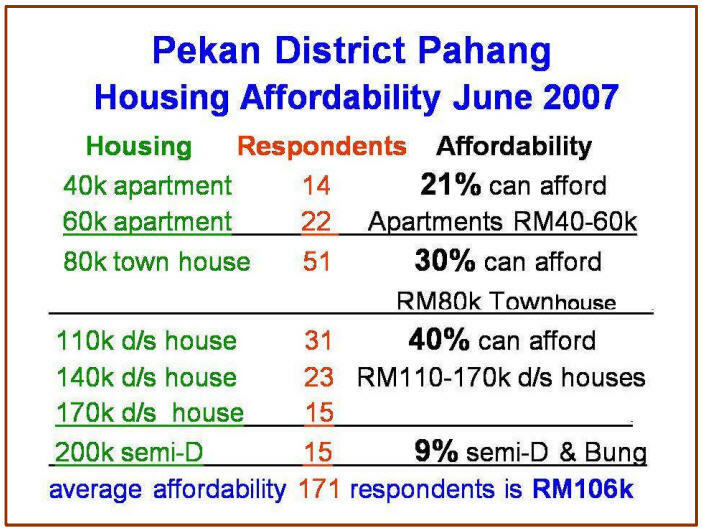 Affordability is something that professional economists study and the most common measure of it relates the cost of housing to income. The current measure in the US shows that though house prices are tumbling down fast, people's income (at least in aggregate) are still holding steady. So there is a silver lining to the current recession: housing in the US has become so much more affordable. My friends at UPM and I took another view; and we came upon it almost by accident. It was a by-product of work we were doing with consumer preference surveys. Our aim was to gauge consumer acceptance of our new Honeycomb houses, and we were comparing it with conventional terrace houses. At first we just compared a single type of house, but eventually we developed a wider range of Honeycomb house types including Honeycomb flats to compare with conventional products. With a choice of houses that people could look at, we started by asking a simple, very direct question - what sort of house can you afford? Respondents were given a choice of answers: apartments from RM40 000, townhouses from RM80 000, double storey houses from RM 110 000, and so on. With the answer given, the enumerator would show the brochures of the relevant Honeycomb and conventional house type, and then would go on with questions on the preferences of the respondent. This sort of information should be useful for developers. Yet for a variety of reasons, this is not what developers are providing. 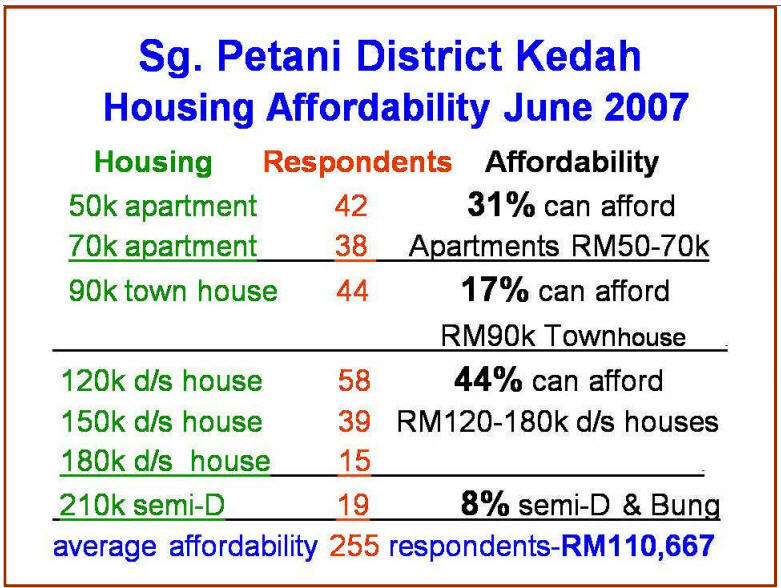 They tend to be building houses that cost more than RM170 000. On top of that they build low cost houses that sell between RM35 000 to RM65 000 that Government rules require them to build. We will be looking at this situation later.